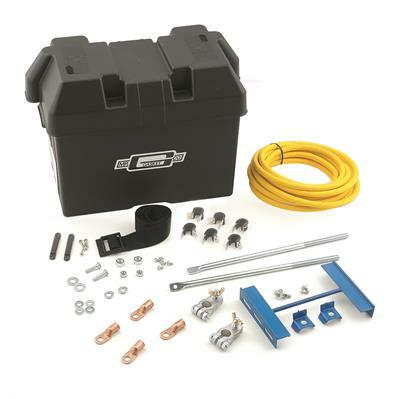 6279 - Mr Gasket Battery Box Kit - Dezod Motorsports Inc - Home of the automotive performance enthusiast since 2002. Includes a plastic battery case molded from polyethylene, battery hold-down and brackets, 20’ of 2 ga. stranded copper battery cable, 4 lugs, a pair of cable ends and related hardware. Case measures 12” x 6 3/4” x 10” high. Bulk packaged. This battery box is a must for all high performance applications. This allows the weight to be put where it is needed, on the rear of the car for proper weight transfer. Putting the battery in the rear is also great for safety reasons and giving you more room in the engine compartment.